Increased production pressures have sparked a rise in inquiries regarding rapid dry-out materials. Often times, the inquirer wants to use a rapid-fire material to reduce the down-time of their furnace equipment. The faster a furnace can be brought back online, the faster production can resume… very important, as time is money. However, people looking for a good balance of refractory properties should consider plastic refractories. They are proven performers and may provide a better cost solution. Fast dry-out refractory materials are advanced castables, usually reduced cement types, bonded by both high purity calcium aluminate cements and silica fume which may have the potential to yield nearly the same properties as their non-fast dry-out counterparts. The benefit is that the dry-outs can be cut in about half the normal time. This can save up to 40-50 hours. However, the reduced properties can affect the overall performance of the refractory. The important decision that the end-user needs to make is the trade-off between long-term strength of the material versus the short-term benefit of getting back on-line. Plibrico’s line of plastic refractories and Exo-Set (TM) products, by comparison, might be the choice to make. While the project manager must determine the cost comparison between installing a reduced dry-out material versus a plastic material, often the plastic refractory remains a solid choice. It gives a balance of good properties along with the benefit of reduced dry-out times. The result is the best of all worlds. 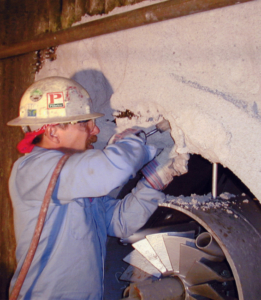 Plastic refractories are useful in many applications, including repairs. They install easily, and Phos-bonded plastics bond well to existing refractory. They have good thermal shock resistance and can be fired immediately at a rate of 100 degrees F/hr. Plibrico’s Exo-Set Uno gun mixes can be a good solution offering material higher placement rates, no curing time required, and a 50 degree per hour ramp up to 1000F. These rates are comparable to most reduced dry-out castables. In the end, Plibrico plastic refractories and Exo-Set products emerge as a clear solution due to their properties, refractory contractor product familiarity, and ease of installation. They have a proven and consistent reputation of success in a wide variety of applications and are often the better cost solution.